I was recently doing some research about the former students who attended the Patapsco Female Institute in Ellicott City, MD. My hope is to find out what happened to the lives of these women after leaving school. True, Patapsco Female Institute transcended the typical ‘finishing school’ of the period with courses in natural philosophy, mathematics and physics, but even still women were not expected to go out in the world and start a career. Despite this fact, I wondered how many went beyond the expected domestic sphere and made a difference in the world. 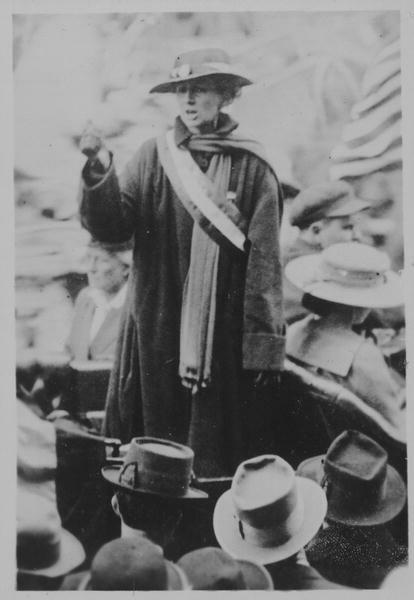 I was searching alphabetically, and when I looked up Florence Bayard Hilles, I discovered that she was a vibrant figure in the women’s suffrage movement of the late 1910s and into the 1920s. While picketing in front of the White House, Hilles was among several women, the Silent Sentinels, who was arrested in July 1917. She was sentenced to a 60 day jail sentence, but only served three, having been pardoned by President Woodrow Wilson. It would still be three years before the 19th Amendment, granting women the right to vote, was passed. There was a huge campaign against women’s vote, postulating that most women did not want to vote anyway, nor were they even qualified to make an informed decision. The right to vote was for all women, regardless of race, however many women from low income background did not vote because of high poll taxes. Those patriarchal views of nearly 100 years ago, stating that most women did not want to vote anyway sadly do not seem too far off the mark. It seems many from my generation and younger, male and female, feel too apathetic to vote. I can’t say I blame anyone for feeling that way. But if everyone who said their vote doesn’t count got out and voted, maybe things would change. Even when I feel like I don’t particularly love any candidate, I always vote because I know how hard the struggle was not even 100 years ago.